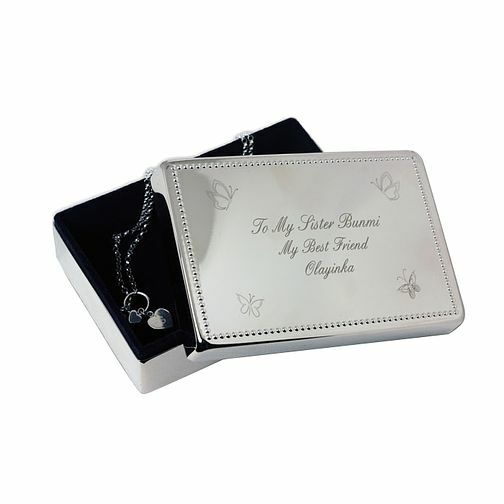 Celebrate that special bond or occasion with the charming silver finished jewellery box. Beautifully decorated with subtle butterflies and a fine detailed bordered edge, add your own personal message up-to 4 lines long. Engraved Rectangular Trinket Box is rated 5.0 out of 5 by 1. Rated 5 out of 5 by Anonymous from Engraved trinket box This item was bought and engraved by Samuel's for a 21st birthday. It arrived in plenty of time. Brilliant quality. Just wright size for holding trinkets.